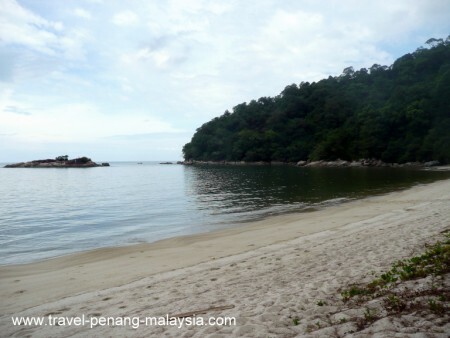 Teluk Kampi is the most remote of all the beaches that you are able to trek to in the Penang National Park and offers a nice stretch of beach around a gently curving bay, that is rarely visited by other tourists. 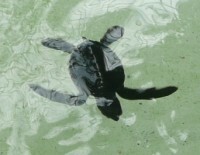 You will have to hire a boat near to the entrance of the National Park at Teluk Bahang, or you can hike the 5km yourself to the beach. 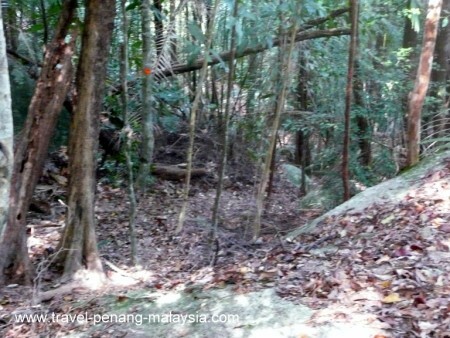 First, you will have a trek to Pantai Kerachut (Kerachut Beach) where you can continue on to Kampi via a 1 1/2 km very steep, narrow and not very well marked pathway through the rainforest that starts at the far end of Kerachut Beach. As you can see from the photo above the hiking trail is not that clear in this area of the park - You have to make sure you follow the markers on the trees otherwise you will get totally lost. 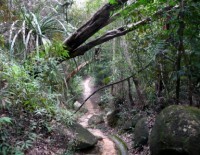 This section of the National Parks hiking trails is the hardest of them all and should only be attempted with the proper gear on (shoes with good grip) as the path is covered with leaves and branches, very steep in places and extremely slippery when wet, making it very slow going. There are no facilities here at all, although when I visited here last time, there was some construction work going on and they were also laying out a new pathway through the forest (do not follow this new path until it is officially opened like I did, as you will find it blocked off after you have walked for an hour or so and will have to come back again to take your original path back to Kerachut Beach). Officially, no overnight camping is allowed at Teluk Kampi, although I know people do camp here. Sadly, over the years they have left behind a disgusting amount of rubbish in the fire pits they have made and this trash has built up behind the beach - please don't add to it - Take out all your litter from the National Park. For me, it really spoiled my visit here and because of it, I would not recommend you put in all the effort to get here just to see a pile of rubbish. 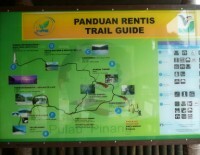 For more information about Penang NP, please click here, or you can view our NP Pictures page here.